Today we are very proud to announce the release a major update to Swift. This update is going to make building business sites a super easy, fast and fun task. Not just that, maintaining and updating it is also going to be very easy. 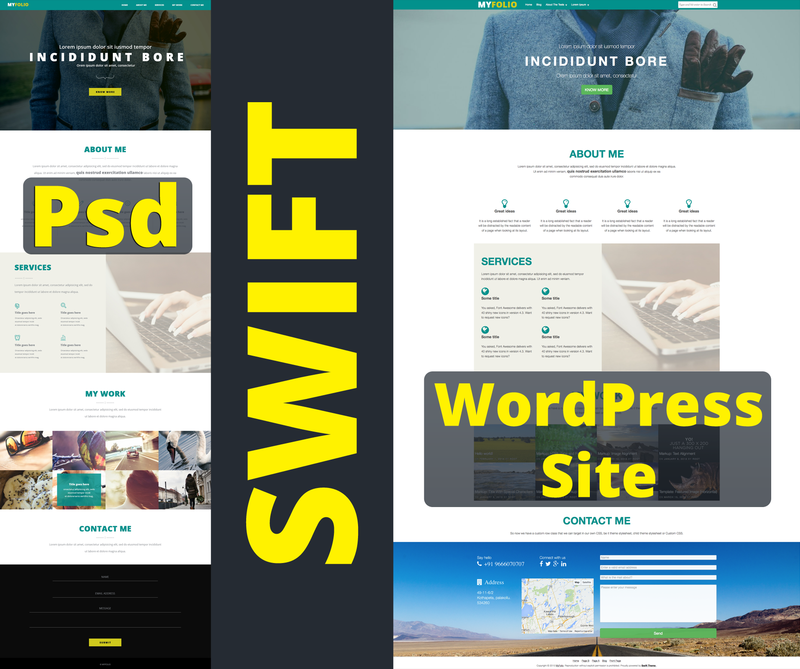 You can convert a PSD like this into a WordPress site with Swift in less than 2 hours. At that time, there was a major update to the plugin in the pipeline so we decided to hold on until a beta of the plugin was ready. Once the plugin was available, we tried to convert some PSD’s to WordPress sites using PageBuilder and Swift. This gave us some good insights on what you as a developer will need to build business sites. With this knowledge, we added everything you will need to build responsive business sites. New additions to help you build business sites. 5 new caption styles for the slider. Optimizing the page builder plugin by removing unnecessary scripts, CSS and fonts. Option to set device specific CSS on per page/post basis. With the number of options, theme settings page were getting heavy and you can see its affect on the amount of time it takes to customise your site, special if you are on a slow internet connection. This became more important as we introduced built in background picker few versions back. To address this issue, we added ajax these pages to speedup customisation process. Smart posts widgets not only help you in building business sites. You can also use them to build stunning magazine style blogs or new sites. There are still a lot more changes and improvements under the hood, all to make the theme more stable, fast and efficient. We setup a new demo site, it’s still a work in progress. If you are already purchased Swift, you can download this version from the members area. I am using Swift V 7.2.4, I followed the tutorials for business site however in spite of selecting the page template as full width and disabling ads, it is still showing ads on the page. I am using 2 Ad. One is leather board 728*90 and another is Ad sense link ad unit below the category navigation menu. I am sorry for posting my issue here because, I didn’t find the login option at your support forum! Does this version need the page builder plugin for the business site?